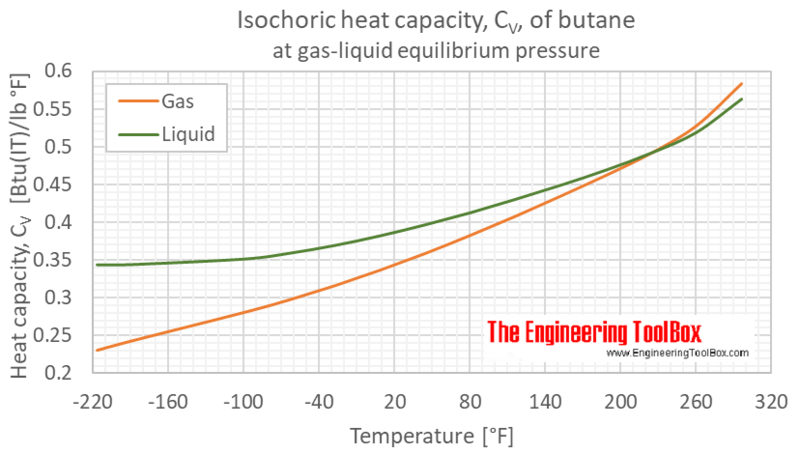 At ambient pressure and temperature the isobaric specific heat, CP, of gaseous butane is 1.73 kJ/kg K or 0.414 Btu/lb °F = cal/g K, while the isochoric specific heat, CV, is 1.57 kJ/kg K or 0.374 Btu/lb °F = cal/g K.
However, the specific heat - CP and CV - will vary with temperature. 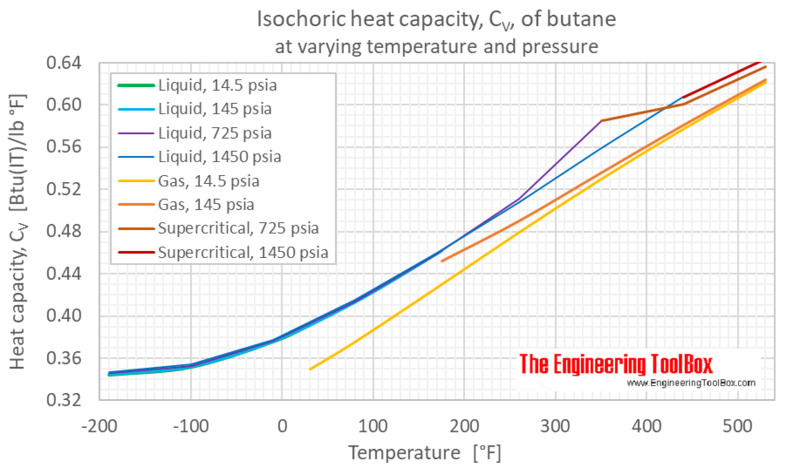 This may influence on the accuracy of butane conditioning and industrial butane handling process calculations. 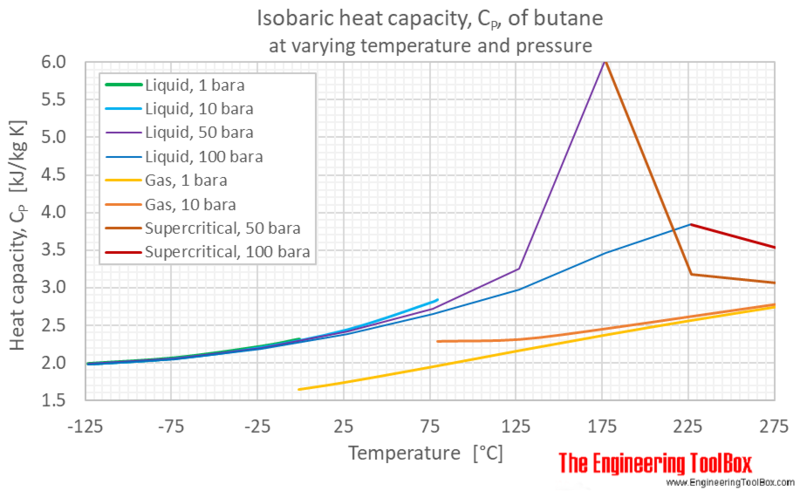 When calculating mass and volume flow of butane in heated or cooled systems with high accuracy - the specific heat (= heat capacity) should be corrected according values in the figures and table below, or found by use of the calculator. 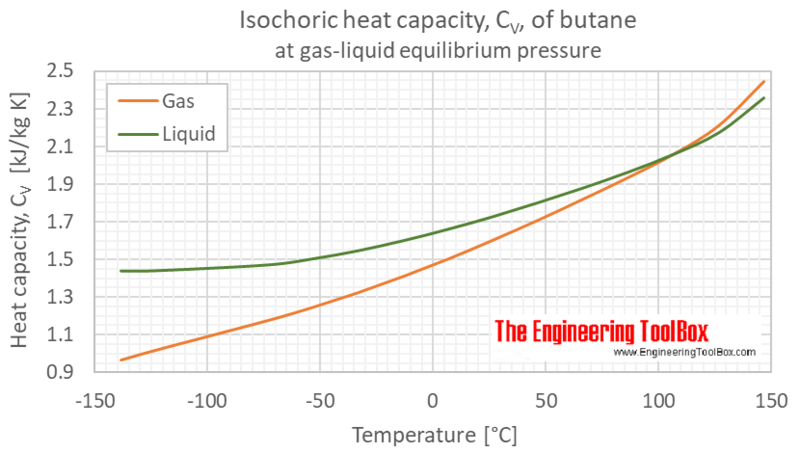 The calculator below can be used to estimate the heat capacity of butane at constant volum(CV) or constant pressure(CP) and at given temperature and atmospheric pressure. 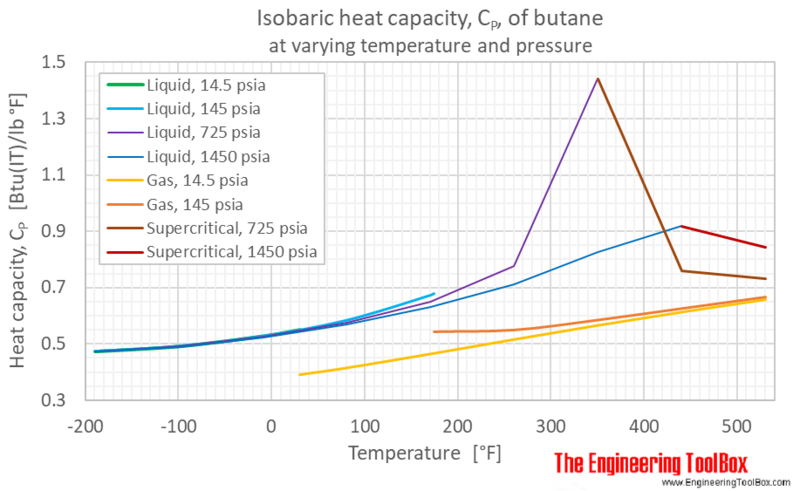 For practical purpose the heat capacity of liquid butane at a given temperature is constant with varying pressure up to 50°C /100°F. Boiling point of propane is -0.8°C / 30.5°F, and thus, butane is present as liquid below this temperature at atmospheric pressure. as well as Specific heat (Heat capacity) of Air - at Constant Pressure and Varying Temperature, Air - at Constant Temperature and Varying Pressure, Ammonia, Carbon dioxide, Carbon monoxide, Ethane, Ethanol, Ethylene, Hydrogen, Methane, Methanol, Nitrogen, Oxygen, Propane and Water. For full table with Imperial values - rotate the screen! Engineering ToolBox, (2018). 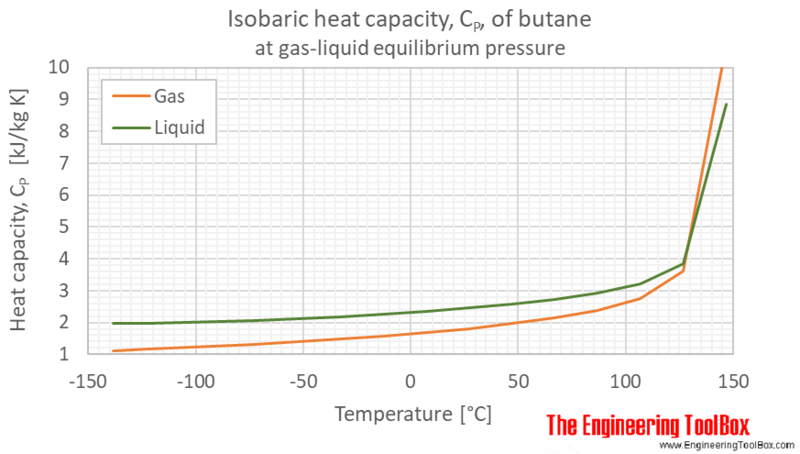 Butane - Specific Heat (Heat Capacity). 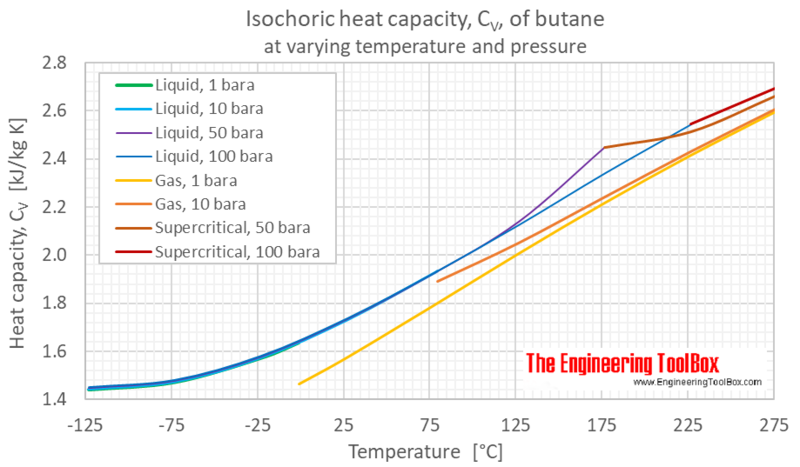 [online] Available at: https://www.engineeringtoolbox.com/butane-C4H10-specific-heat-capacity-Cp-Cv-isobaric-isochoric-d_2087.html [Accessed Day Mo. Year].